Whether you need disposable glasses for a special event or just want to have a worry-free evening on the patio, plastic champagne flutes expand your options for drinking sparkling wine. Traditionally, Champagne was served in a glass called a "coupe," which had a wide saucer-shaped bowl on top of a narrow stem. Champagne coupes were popular until the 1960s, when they gave way to the champagne flute. Flutes have a narrow trumpet shape, and they allow the wine to retain its carbonation for a longer period of time. Because of their narrow shape, it's also easy to carry several champagne flutes on a tray. Have you ever thought that an event would be perfect if only you could bring a bottle of Champagne to celebrate? Glass champagne flutes are impractical for many situations, but plastic wine glasses and champagne flutes have several advantages over traditional glassware. Plastic glasses are perfect outside. Many people have concerns about bringing fine crystal or glassware out on the patio or deck. It's too easy for a glass to get broken when you're on hard surfaces and dealing with wind and crowds. Plastic stemware is the ideal solution to this problem. Unlike your grandma's fine crystal, if someone bumps a plastic glass, it will bounce. If you're having a large get-together, such an informal wedding or family reunion, you may want to have a Champagne toast. However, the idea of washing dozens of glass champagne flutes might make it a little harder for you to celebrate. Plastic flutes are a great alternative. When the party is over, you can pitch the dirty glasses, making cleanup a snap. While your children shouldn't be sipping alcoholic beverages, they might want to get involved in the celebration with a sparkling grape juice or special fruity soda. No hostess in her right mind would allow the kids to run off with her crystal, but plastic is about as kid-friendly as it gets. When you can give plastic flutes to the younger members of your group, you include them in the fun. As with any disposable dishware, plastic wine glasses and champagne flutes can prompt environmental concerns. Unfortunately, biodegradable plastic isn't strong enough to produce a long-stemmed glass like a champagne flute. However, many manufacturers produce plastic glassware that is recyclable. If possible, look for plastic flutes that can be easily recycled in your area. Call your recycling company or household garbage management service if you are unsure about which types of plastic they will accept. You can find plastic champagne flutes at many housewares stores, but if you're looking for a good deal, the Internet may be your best bet. By shopping online, you can find the design that's perfect for your gathering, and you can compare prices to get the best per-glass cost. If you're comparing the cost of plastic champagne glasses against traditional glass flutes, you can expect to pay about 60 cents for each plastic flute. You may pay less if you buy in bulk. Simple, traditional champagne flutes retail for about six dollars apiece, so you would have to use a glass ten times to make glassware a better deal. 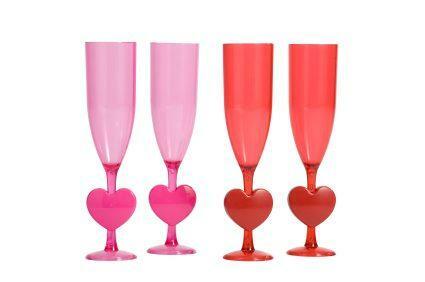 Enjoy the convenience, safety and cost savings of plastic champagne flutes at your next party.